With only a remnant of snow remaining, it is beginning to feel a lot like spring here in the Upper Peninsula of Michigan. The ice on the bay is breaking up and the “fishing bug” is in full force. Only 8 weeks remain until opening day of Walleye season. The second most highly anticipated day in the UP following deer season opener. But for the next two months, fishing will only be a dream. So until that time comes, I guess I better make the best use of my time and review the AJ Fernandez Bellas Artes in the Short Churchill format. Manufactured at Tabacalera A.J. Fernandez Cigars de Nicaragua located in Esteli, Nicaragua, the Bellas Artes is produced in four box-pressed vitolas: Short Churchill (6 by 48), Robusto (5 by 52), Toro (6 by 54), and Gordo (6 1/2 by 60). 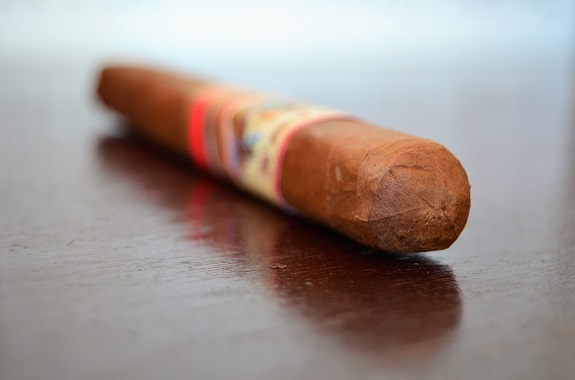 The cigar utilizes a hybrid wrapper leaf named “Rojita” over a Nicaraguan binder and three-countries are represented in the filler tobaccos. 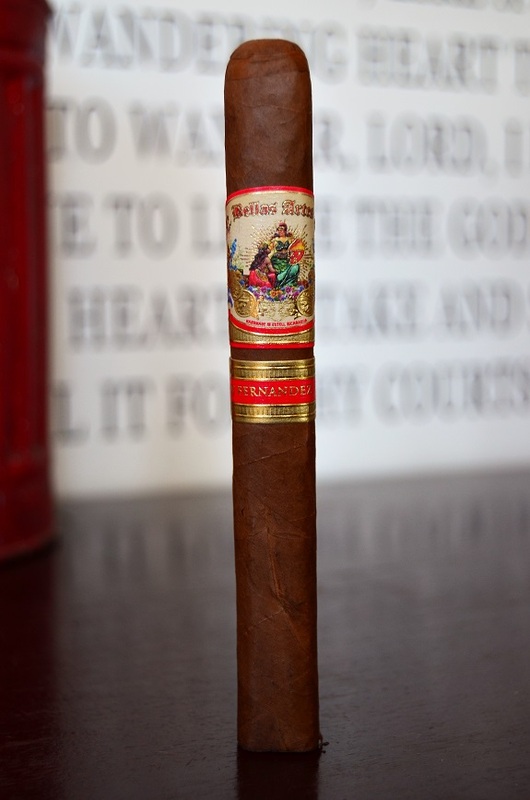 The Bellas Artes are packaged in 20-count boxes and run between $8.30 and $10.50 per stick. You can order the Bellas Artes from our good friends at Ford on Fifth Here. AJ Fernandez’s Bellas Artes sports a tan hybrid wrapper that has a reddish hue. Due to the lighter color, even the small veins are visible on the leaf. Along with some bumps and stretch-marks, there are dark watermarks and other color imperfections on the leaf. 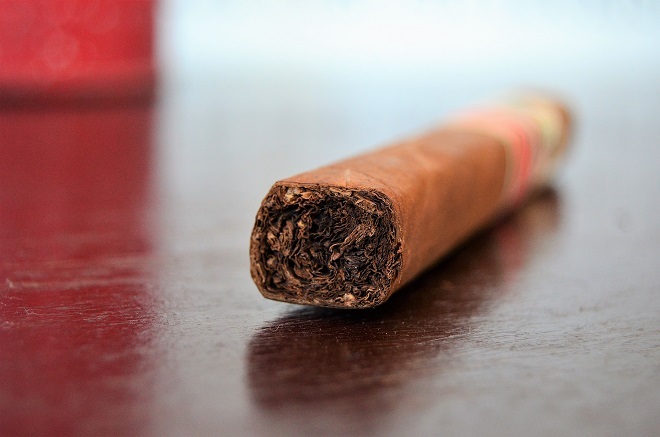 This cigar is far from rock solid and about two-inches down from the foot there is concave area. 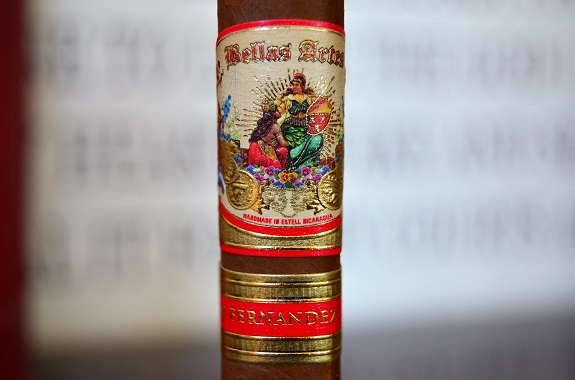 As I bring the AJ Fernandez Bellas Artes to my nose, the wrapper shows an aroma of red wine, vinegar, and dark chocolate. Much of the same aroma transfers to the foot of the cigar with an additional oak. A quick cut through the double cap opens up a wonderful draw that brings forth cold draw flavors of grape and rich cedar. There is a cinnamon-like spice that is mild in terms of flavor and mild to medium in spice heat that lingers in the mouth. 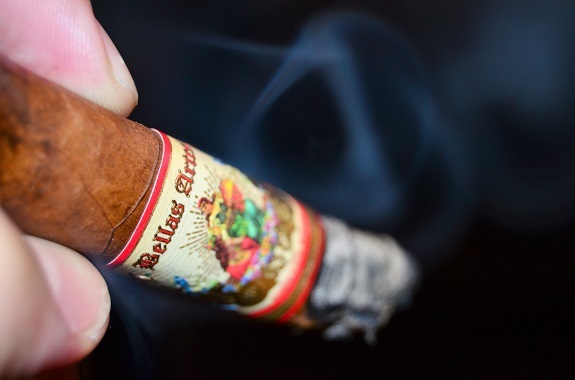 Once lit, the Bellas Artes requires no time to warm up as it immediately begins pouring out flavorful smoke. There is a lot of depth to the flavors making it difficult for me to pinpoint any specific ones. There is a central woodsy flavor that is complimented by several different spices and a light caramel. At an inch in, a grape-jelly like flavor arrives in the profile adding a new dimension to the sweetness. The flavors are well balanced and full through the first third. A dark gray, ugly ash is forming as the burns evenly with a thick carbon line. Making my way into the second third, a rather large section of the wrapper is struggling to burn with the rest of the tobaccos making it necessary to perform a touch-up. The Bellas Artes has shifted up in richness and spice as the profile is dark and meaty, but still being rounded out by the subtle caramel sweetness. The earlier grape jelly flavor moves in and out of the profile and only shows up every handful of puffs. A black pepper flavor pushes forward in the profile as I make my past the halfway mark. With only a few inches remaining, the Bellas Artes delivers earthy and char flavors. Allowing more rest and the cigar to cool between draws, the earlier flavors shine through. As I pass the smoke through my sinuses, the pepper and spice are full and I am beginning to feel a good amount of strength. 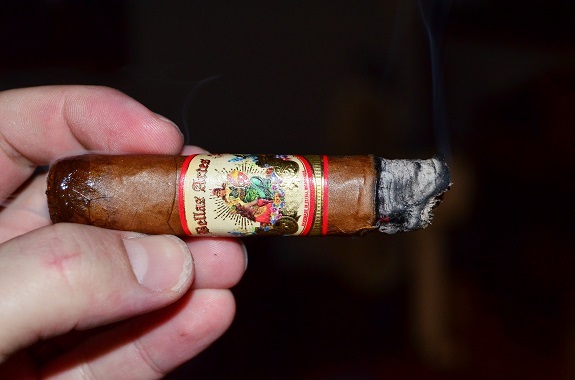 It is without hesitation that I can say the Bellas Artes Short Churchill is one of the best cigars I have smoked from AJ Fernandez and he has a huge portfolio of solid cigars. 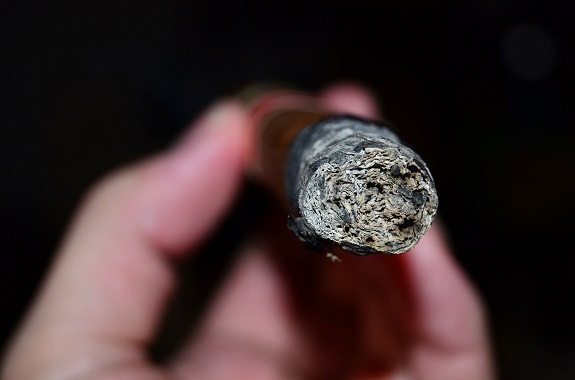 The cigar hung in the medium to medium/full arena in the flavor department and the strength continually progressed to full by the final third. As mentioned in the review, there was great depth to the flavors that were well balanced and evolving. The burn issue in the second third impacted the flavors, but after a somewhat major touch-up, the smoke and flavors were once again pouring out and satisfying my palate. The other sample smoked for review did not show any of the same burn related issues. The box-pressed format in the Short Churchill vitola is a fantastic size and for just over $8.00 this is a cigar I can highly recommend. Beat me to it! Pfft. lol Great review, Jeremy! Now I’m really looking forward to lighting this one up. Great review, Jeremy. Looking forward to trying it. Haven’t had much luck with AJ blends, but it has been quite a while and he seems to be hitting home runs. I’ll add this to Last Call and Enclave as ones to pick up.